I have been trying to get a picture of this quilt for several days. This morning I decided that I was done waiting for the perfect time and weather, and went out in the clouds and drizzle. 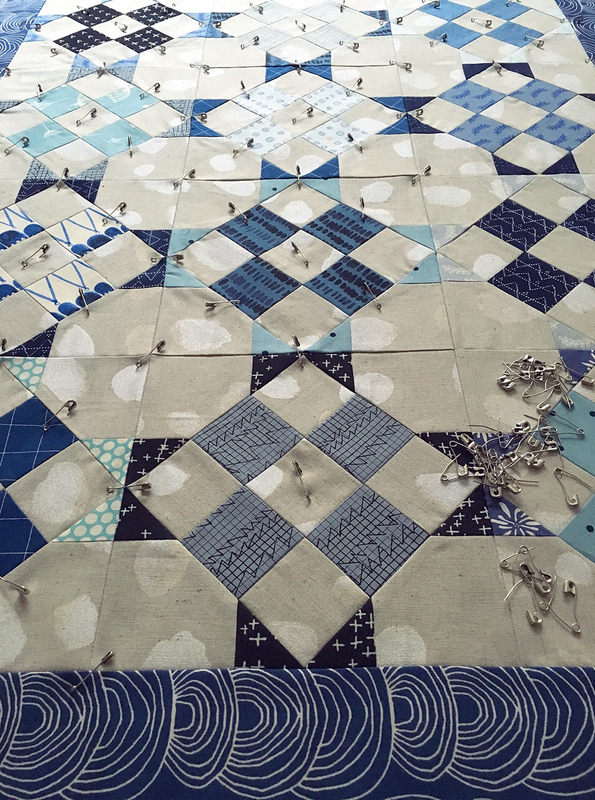 This quilt was based on Nancy Cabot's vintage block, Union Square. You can read more about the history of the block in this blog post. The weather made photographing this one a bit hard, but I did take a picture of the full top on my design wall inside before I quilted it. Basting and quilting this one was super fast because of it's small size. I quilted it in a meandering, free motion design. I do love using my BERNINA stitch regulator (BSR). I really love how this quilt turned out. The border finishes it off nicely. The fabric is from Rainwalk by Anna Graham of Noodlehead, for Cloud9. For my backing and binding, I used Petite Plus by Rashida Coleman-Hale for Cotton + Steel. The quilt ended up measuring in at 34" x 43". I plan on hanging it up in my sewing space. Blue is my favorite color afterall! Next up, I need to finish my daughter's teacher's quilt. I am ready and just waiting for her to finish the embroidered label for the back. School is out in 2-1/2 weeks! Eek!